21st KLPJ Wedding Fair 2019 is going to open on 19 Apr and finish on 21 Apr 2019. The venue of the Fair will be Mid Valley Exhibition Centre which is one of the awesome place for such an important event. KL-PJ Wedding Fair 2019 may be a medium where many highly recommended products and solutions are exhibited. Several of these tend to be about Wedding, Wedding Planning, Bridal Accessories, Bride, Bride Accessories, Honeymoon and Wedding Services. KL-PJ Wedding Fair 2019 is four times a year Fair. This year more than 55000 of your colleagues are coming together in Kuala Lumpur, Malaysia for KL-PJ Wedding Fair 2019. 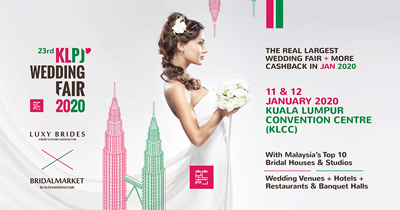 KLPJ Events is the PCO of KL-PJ Wedding Fair 2019, 21st KLPJ Wedding Fair 2019.